Read What Other Big Pine Guests Have Written! Although we can tell you about our home, perhaps the best way to understand what it is like to stay here is to read honest impressions from visitors just like you. We invite you to browse through this transcript of our guest book. Enjoy! We enjoyed staying in your cabin. The kitchen was great and well stocked. We hiked in Yosemite Valley, visited the Wawona Pioneer History Center, and explored trails in between. Your place was perfect for our family with young kids. The crib and highchair were great. Our boys (5 & 7 years old) loved having their own futons. They especially loved the sunroom. We loved our vacation and we even cleaned the playroom! There were 4 kids and 4 parents who all loved the house! All of us rated this house 5 stars!!! We all had a great time in this house. Thank you for your hospitality. You have a lovely mountain home & we were very comfortable staying here! Thank you! It really does have all the conveniences of home, we never felt like we missed anything! Very comfortable beds, loved the shower upstairs, kids + puppy played in the snow in the back + we found a fun little sledding hill nearby. Lots of great movies on TV. Enjoyed 2 days in the park - Bridalveil Falls was our favorite hike. :-) Also took a jeep tour to the Sequoias which was fun. We would love to come back + stay sometime! Thanks very much for your hospitality! We had a great time here. We built an igloo and playing in the snow. Watch out for the shrew! There's lots of fun games. I had a great time. We went sledding. We found a snowball maker. My brothers built a tunnel. We made a snowman. We had a great time. p.s. watch out for the shrew. The cabin is very cozy! We had great fun in the snow. The weather was fantastic. We went swimming in the lake, it was freezing! JK! CJ was a great cleaner and brightened my day! We made a great igloo in the back! :-) Come check it out! We really enjoyed staying here and I hope others do too. We will come back soon! We had a very good time in the cabin. It was a nice cabin, we loved playing in the snow on the deck and in the back yard. We had fun ice skating at the lodge across the street. We went and made an igloo in the back, it was really fun! We would love to come back soon. p.s. hope you have a good time. The cabin was great. Well stocked and clean. Our family had a wonderful time. Snow, rain, sledding, igloo, snowman and more. Thank you very much for your wonderful hospitality! We had an amazing stay here, it is indeed a beautiful place to be, and we will return again! Thank you so much for sharing your beautiful cabin with us. I love the spacious kitchen and living rooms. The seating/play area upstairs is great for kids. There was plenty of snow, sledding, ice skating and other activities to keep everyone busy. However on Wednesday we had huge amounts of rain. Was great to watch it from the sliding glass door with a fire going. Thanks again for everything and keeping your cabin so well stocked! Can't wait to come again! Happy New Year! Thank you for a fun weekend! Great friends, yummy food & drink, and lots of snow play & sledding. We'll be back soon! Thank you so much for providing such a wonderful stay! It was the greatest way to share my 30th birthday with my family. We were so impressed by how well stocked/prepped you are here and it was so nice and clean and cozy. We can't wait to come back! Visiting to attend the Environmental Law Conference at the Tenaya Lodge. Brought the whole family: husband, mom,dad, mother-in-law,+ 2 kids (ages 1 and 3). The cabin was perfect for us! We enjoyed the fireplace, walking to the Tenaya, and all of the kid friendly features. Thank you so much for having us, and we hope to be back again for future conferences. We chose Yosemite to celebrate our fifth year of marriage, We brought our two young children, 1 and 3 years old. This house was perfect for our little family. We enjoyed exploring Yosemite Canyon, Nelder Grove and the town of Oakhurst. Your house made our experience complete and everything we could imagine for a trip to the "wilderness." Home away from home! Very well stocked with all the conveniences of home. Clean & cozy. Will definitely be recommending this place to friends with families. This was Dad's first plane trip in 56 years!! I am grateful we had a place like this to bring him. He especially liked the well-stocked kitchen. Thanks for a rad spot. We were so stoked out of our brains to stay here. This place is just swell. Epic views, epic rooms, epic times! Thanks for the spot - it looks great and feels even better. Insanely comfortable and it was great to rest at after long hikes and long days. Thank you for keeping such a cozy cabin in the woods to rent! We loved the place. We've rented many VRBO places, but this was the best stocked kitchen, bathrooms, etc that we've ever seen! Even Q-Tips and Alcohol for sap! Wow! Thank you for that extra effort!! It was also very clean and well-kept. Thank you so much for sharing your wonderful cabin with us. The size was perfect for my large family. The kids loved the TV/Play room. The cards and the bear rug were a few of their favorite things. It was great to return here after spending a long day exploring Yosemite & swimming at Bass Lake. We really enjoyed our stay here. Thank you very much for this nice cabin in the middle of the forest. We loved it! We came for our father/father-in-laws 80th birthday. We loved that the house had everything we needed and more: Netflix, baby carrier/backpack, a kitchen with everything, and the baby fence. This was the first house that we ever stayed in that had it all. We all really enjoyed our stay & hope we can make it back. Thank you David & Suzanne for sharing this special place with us! The O clan had a wonderful time! Glacier Point was our favorite spot! Thanks for letting us make our house our home-away-from-home! This was the perfect location for our vacation! We had a three generation trip to Yosemite! The cabin was more than expected. So comfortable and cozy. Anything we needed for cooking or may have forgot was here. Wish we could stay longer. Thank you for everything. We had a great time! This was our first time in Yosemite. Thank you for letting us stay in your wonderful cabin. It was great to come "home" to all the comforts. Thanks for all the amenities, it was such a blessing. Old college friends and spouses gathered here for a friend's wedding at Tenaya. This was the perfect place for _all_ of us. We had a fabulous time. Thanks for providing so many great extras - shampoo, lotions, etc - to make this stay comfortable. Awesome cabin. Thank you for having a "well-stocked" kitchen. Can't wait to bring the whole family here. Brady, our German Shepherd says "thanks" for being "dog friendly!" This place never fails to generate new memories. Just magical. Thanks _so_ much for the hard work and effort that goes into such an amazing house. It is the most incredibly well-stocked get-a-way we have stayed in in 25+ years! Everything was spotless and we were instantly "at home." We had a great visit to the gorgeous sites each day and a wonderful time to relax each evening. We loved staying here during our family vacation! We had folks from NY and NJ as well as San Diego We enjoyed sitting in the cabin. It was so wonderful to have all the comforts of home plus more! Despite some rain and snow, Yosemite was absolutely beautiful, It was a trip we won't forget! Thank you for sharing your amazing home with us! Our family truly enjoyed the stay! Great location! Thank you for stocking the many extras, that really helped us out. We are already talking about our next visit. Thank you again from J, K, E, I, & C.
Thank you for letting us enjoy your lovely cabin. It accommodated our larger family perfectly. It was very well stocked more than any other place we've stayed in. The location was superb as well. Great cabin for family time & to enjoy Yosemite. Can't wait to come back to do it all again. Thank you for allowing us to stay in your wonderful cabin. It is the most well stocked of homes we have every been in. There was nothing that we needed that we couldn't find. Our dog would also like to thank you for allowing us to bring him. It is not always easy to find a dog friendly cabin that is clean and comfy. This was a perfect spot for us to get together with our friends up north and their kids. Everyone is excited to return next year and we hope Big Pine will be available. As I sit here writing this next to the warmth of the fire, I looked over at the recliner to see my boyfriend and our 6 month old daughter sleeping :-) Our dog Juno is dreaming away behind the loveseat. Heavenly. We are taking off fairly early tomorrow, so I thought I would take a moment from watching European Vacation to say _THANK_YOU_ for providing such a lovely home! We spent several days in the park, taking in the lovely -- [strikeout] Majestic is more like it! :-) -- sights and it was my boyfriend's first time to the park, so it was extra special for him! It was absolutely wonderful to come back here after long days spent in the snow and thaw out next to the fire. Thank you for another wonderful winter vacation! We love spending New Years here. There was so much snow for sledding this year! We all had fun. Thank you! Thank you for everything! We had a beautiful Christmas here in your home. A foot of snow...what a gift! Snow shoeing, sledding, tubbing, exploring -- Earned our Jr Ranger badges... Best time we have had at Christmas in years! Hope to be back to check it all out in summer! Beautiful Home in an even more spectacular location. Thanks for a great Thanksgiving weekend. We had a great snowy stay! (Drawing of pine tree with squirrel). This cabin is a nice, spacious but cozy, place to stay right next to Yosemite Valley. It is really beautiful out here, we hope to come again soon. Thank you so much for the wonderful stay in Yosemite! And for letting your house be dog and kid friendly. This was the perfect place for our whole family to spend a long weekend together. We loved our hike to Sentinel Dome and Taft Point as well as exploring the Valley. We enjoyed our time here! Well stocked house & kitchen! Love the lotions in every room. You have thought of everything a guest may need. Thank you very much. We had an amazing weekend! Visited Yosemite daily, hiked up to Vernal Fall, Glacier Point, and Sentinel Dome. Also hiked all over the Yosemite Valley. Beautiful location & residence! Thank you again! We enjoyed our stay in this beautiful cabin. We found it to have everything we could possibly need. We visited Yosemite often and frequented the local coffee shop "Cool Bean" on days that we needed to rest our legs. The hike from the valley floor to Half-Dome is bretty though, especially when you get off the trail and add 2 miles to 16. It was a beautiful summit, however. We also hiked the valley floor and somehow got lost despite doing 10 miles. That was gorgeous nonetheless. The entire area is beautiful and a great escape from the big city life of Houston, Texas. We enjoyed the solitude and found comfort in playing Rummy(?) 500 and Scrabble. We even took the historical train tour through Sierra National Forest and went horseback riding down the road. Overall, our second week of marriage was made special because of your hospitality. 1) Swing Bridge Trail in Wawona --> talk to the awesome rangers about shortcuts & must sees --> bring a swimsuit! 2) Lewis Creek trail --> no water this time of year but still fun! Saw mountain lion paw prints! 3) Glacier Point! If you have not been, you should go! Evening or early morn are best & less crowds. 4) Nelder Grove --> Shadow of Giants trail. Sicne Mariposa was closed, had to see these beauties somewhere else, worth the extra drive, however _DO_NOT_ do the google maps thru road 630, take 632! 5) Yosemite Valley: must see everytime. Standing on valley floor looking @ the views never gets old Vista points & sunset views are the best. -- Thanks for lending us your home for a few days. Very comfy & lots of great extras around the house, super spacious. Lots of BBQs & star gazing. -- Thank your CJ for the awesome tips! Loved enjoying our space with the "pterodactyls." We watched & listened to them each morning! Our time went by too quickly. Great house. Best supplied cabin I've ever been in! Thanks David for all your efforts to fix our miscommunication. We're going to Tenaya Lodge for a conference wish we could keep staying here! Had 3 great days playing in Y. Valley, almost no time to enjoy the house. Dr. R K. & Dr. R A & L K.
We came up for a wedding in Wawona and stayed for some days to have some recreational fun. Weather has been nice and overall it was a good experience. This house was accommodating enough for our intended purposes. We did not use the Netflix as most other commenters in this log have mainly because we felt that spending engaging time with each other was a more beneficial use of our time and money. As far as other amenities, we found that this location was not ideal for a 3 year old mainly due to the fact that the game selection was minimal and outdated with many missing pieces. On a separate note there were several recommendations that we sent in email as overall home maintenance and "fix its." We had a great time and would recommend to others that they should stay here in the future. P.S. If you are wondering why we were not "gushing" about how awesome, great, cozy the house is like the others in this log, it is because for the price paid per night it is expected that it is nothing less than top notch. We had a wonderful stay at Big Pine! The house is so cozy and made us feel at home after long days of trekking the park. Definitely a place we put on our list to come back to. The cabin is beautiful. Only thing I didn't like was the beds. We woke up every morning in pain. Tried to use blow up bed but it would be deflated after 1-1/2 - 2 hrs. Kids had a blast finding pine cones, sticks and the brick wall. We loved the porch and being able to sit outside except we were eaten by sketos. We had a nice experience and barely used the TV, internet or our phones. Thanks for this experience. H family reunion - 13 people (5 kids) together for the first time in a decade. Also - entirely wonderful in every respect - couldn't have been better - Thanks for such a lovely place, so well appointed and comfy! Thank you so much for the beautiful fun time in your cabin! You guys thought of everything! Great vacation! Great family time in well appointed cabin. You thought of everything!!! Thanks for the memories! What a beautiful cabin in a beautiful setting. Everything was fantastic! Thank you so much! After a long drive we arrived in the evening, tired and cold - we found a nice cozy and warm cabin with the lights on. Thank you for this nice welcome! Thank you so much for letting us stay at your wonderful cabin! It was so cozy and warm against the cold weather, and was nice to come back to after a wonderfully tiring hike. Everything worked out great and will definitely recommend it to other people. P.S. We loved the teas too! Your cabin felt like home. Thank you so much for the beautiful cabin for a week. We had sun, rain, & even snow, saw deer, squirrels, birds, and even bears up at Glacier Point. We can't wait to bring our friends and family. Thanks for letting us stay here it was warm and cosy. This cabin was well organized. Thank you for sharing your beautiful home with us! We had an awesome time; and hope to be back soon. We enjoyed every minute of staying in this beautiful house. Thank you for providing such a wonderful and cozy house. We are looking forward to coming back. We had a great time in your cabin. It was a perfect spot to return to after a long day spent in the park. You were not joking or exaggerating about the "home away from home" - found every little thing that one could imagine to need for cooking, entertaining, or simply relaxing in the cozy warmth of your family room. Thanks and see you soon! What a perfect place for a family outing. You have thought of everything and that made it very easy for us to relax. We will come back again and hopefully we will have snow. Our first time here & most certainly not our last. A great cabin (thank you for being so thoughtful in what you provide for your guests), and a wonderful location. Everything we wanted and more. Thank you so much for a wonderful stay in your beautiful cabin! We couldn't get over how well-stocked it was. It seems you though of everything! This place accommodated both of our families with young children perfectly! The crib was a huge bonus! Thanks again! What a perfect start to a wonderful new year! Talk about a home-away-from-home! We had everything we could possibly need, and more. -The Ws -- this is our 2nd time here! Thank you for supplying so many necessities! We really enjoyed the comfy furniture and yummy teas! After hours in the snows, it was nice to come home to your powerful heater and fire place! Such a beautiful cabin! We enjoyed a great Thanksgiving weekend here. The house was cold when we arrived, and we were not used to wearing sweaters all day since we live in Southern California. The park is wonderful, and so is your house once we had it heated up. This is one of the best equipped vacation homes we ever stayed in. This was our first trip here - the accommodations were just great! Anything we needed to cook, clean, etc was available. Great times! A wonderful restful place to stay. Wish ours had been longer. So comfortable and well stocked with everything you could need. Big Pine was a great place for our family. Great space for all of us. We appreciate everything provided in the house - made the stay very comfortable + much easier with our kiddos. Thank you! We came for a family wedding at Tenaya. Enjoyed a weeks stay visiting Yosemite, hiking, long walks in Mariposa Grove. Enjoyed a marvelous dinner at Erna's Elderberry Inn. Our 1 year old granddaughter made good use of the high chair and baby bed. We would highly recommend this "home away from home"
We enjoyed our stay here. Thanks for everything. Beautiful place. We really enjoyed staying here. Thank you! We very much enjoyed staying here - everything you need, plus a beautiful setting. So much to see + do here...it goes without saying! Loved staying at Big Pine! Beautiful setting, close to Yosemite, a lot of space, has everything you would ever need. Our family had a wonderful time visiting Yosemite and staying here at Big Pine. Thank you so much for making it work at the last minute. I think it was meant to be. Thank you for allowing us to stay in your warm and welcoming home. The beds were very comfortable and provided us with a good template for some well needed relaxation after the "hustle and bustle" of Las Vegas. Excellent television service and Netflix was a main attraction! Once again, thank you for letting us stay in your wonderful home and we will certainly be recommending such a holiday to our friends back home in the UK! Thank you for providing such a warm, comfortable, and inviting home for our family. The location was very convenient from the park entrance. The home was wonderfully stocked espectially the kitchen. We made dinner every night and it felt like home. The cable TV was very much appreciated. We look forward to coming back here to see the beauty of God's theater in nature and to make new memories & to relive old ones. We made breakfast & dinner here and watched Ninja Warriors on the tube totally enjoying ourselves. Thanks for accommodating us with everything we needed & for making our stay here one of joy and warmth as a family. This home & Yosemite are unforgettable! We enjoyed your teas. The beds were comfy and soft and the blankets are soooooo soft. Also um theres pretty flowers yeah. The best trip we've had in a very long time! Couldn't have looked for a better place to stay. Yosemite = who has words for that? The cabin after = our kids loved the movies and we loved relaxing. We had a lovely time here at the cabin. Spent our first evening at Mariposa Grove. Next day we hiked the Vernal and Nevada Falls. Day after that we hiked the valley and Taft Point. (really great views at Taft Point!!) The helpful signs remind us of our grandparents. Thank you for the WiFi, a nice amenity after long days of hiking. Our grandparents have kept a log at their beach house since 1972. It's a great source of family history now. P.S. If you haven't seen Mile - Mile and a Half on Netflix, we thought it was a very entertaining documentary of hiking the John Muir Trail from Yosemite to Mount Whitney. Thank you so much from me and my wife. We really enjoyed ourselves so very much. Very impressed with all the little things you had in the house that made it so comfortable! Close proximity to Yosemite - AWESOME!! Watched movies on the great TV at night, relaxing after long hikes in the park. Great kitchen, lots of supplies, easy to move around and feed our crew. Just wonderful! We'll be back! 5/12 - We had such a wonderful stay. The cabin has everything you need and more! Beautiful! Thank you! What a beautiful cabin this was! Spacious enough for all 8 of us. We hiked the 4 mile trail to Glacier Pt. It was a very treacherous hike but the views were spectacular. We loved the free Netflix and watched movies with the fireplace going every night. On our last night we made S'mores with the fire, which was a nice treat! Thank you for a wonderful place to stay and relax! It was perfect. Thanks for a great place to rest and relax! It is a world away from Merced! Wow! This is such a beautiful house! It was the perfect place for us to stay during this vacation. We enjoyed our stay here very much. Thank you! Thank you for allowing us to make memories for our families in your home. We had a great time. Great memories were definitely made here, thank you for allowing us to spend such a wonderful vacation in your beautiful cabin. We spent a very lovely New Year's in your beautiful cabin! We loved the layout, the spacious deck... and the kids loved the upstairs "hideaways" - it was such an adventure for them. We enjoyed the fireplace - spent New Year's grilling and sharing in good conversation in the living room. The views and walks were amazing - thank you for sharing your home with us! Thank you David for being so patient w/ our travel plans. Great memories & beautiful experiences. We felt right at home from the moment we walked in. Thank you for helping us have a wonderful holiday! The Gs & Lots of other family! A surprise snow, fly fishing, big trees, a meeting of the Western Association of Map Libraries, a hearts lesson, Pop o matic Trouble, slow service at Tenaya (home cooking is better anyway). A great week on Railroad Ave. Thank you for opening up your home - we had a wonderful time. One of the most relaxing vacations ever. Yosemite was closed due to the Gov't Shut Down - however it didn't really matter. We had a wonderful time. We loved being so close to the park entrance. Kitchen amenities were perfect and space heaters kept the chill away. We'd definitely come back here & stay again. What a great cabin to stay for our Yosemite trip! It is so well stocked and has everything your could possibly need. Very clean and well taken care of too! CJ the caretaker, made us feel welcome as soon as we arrived and showed us where to find a nearby trail for a small evening hike. David, the owner, even helped me trouble-shoot my WIFI connection problems on my iPad from afar! So helpful! Cabin is perfect. Thank you. Praise God for his displayed magnificense! We had an amazing time here! My family stayed here for my Yosemite Wedding at the Wawona Hotel. The cabin is gorgeous and relaxing - we don't want to leave! :-) Thank you for letting us stay here - we hope to return again. We had a very relaxing time here. I even had the chance to bake an apple bread. Thanks for keeping the home stocked up! Having everything made our stay easier. We are leaving some chopsticks in your drawer. Hope we can come again. What an amazing place! Some of our family members travelled here from Moscow, Russia! This is such a beautiful home! Thank you very much Suzanne & David! We had a wonderful stay in your house. We appreciate how well you have it stocked for things we needed and forgot we needed. When we are back in this area we will be back here. Superb accommodations - everything you can think of is provided. Really enjoyed our stay. The cranes nesting outside really made the trip for us. Fantastic location, we will be looking to make a return booking! Thank you for letting us stay here. It was fabulous! The first few days of our trip were spent at Bass Lake at a resort where we stayed in Chalets. Needless to say we were not impressed with the accommodations there and would have much rather spent our entire trip here in your lovely cabin. This cabin is the most well-stocked and organized place we have ever stayed. Our kids absolutely loved the playroom and it kept them out of our hair for a little while. We look forward to coming back again! Thank you for allowing us to stay in your wonderful cabin. This is the 2nd year we have brought our 4 little girls to Yosemite & the cabin is always a highlight. Your cabin is so cozy and very comfortable. It was so well stocked, I didn't need to bring 1/2 the things I packed! We enjoyed 4 wonderful days in Yosemite & loved coming "home" each evening to a gorgeous and peaceful place to rest. The girls don't want to leave. We plan on returning again! Thanks again for a great experience. Family memories to last a lifetime were made. Had a really great time, great cabin & fully stocked for fun weekend. Better than a hotel. Will be coming back. Thank you for your wonderful cabin - which was well stocked, comfy & cozy!! We plan to return the near future! Thank you very much for making our stay so comfortable. The cabin was perfect and it felt just like home from home. Our time and experience in Yosemite will be remembered by all. We had such a wonderful time here! The cabin is incredibly clean and well-organized. Staying here made Yosemite a highly enjoyable experience. Wonderful cabin, well-stocked & organized. Plus great location for our jumping off point to Badger Pass for snow shoe track to Dewey Point. Homey & comfortable. -Hello! I had a great time with these 3 Germans and an Englishman in this wonderful cabin! The cabin is well nice, extremely well stocked, & Yosemite is amazing. C.J. was extremely helpful & friendly too, even bringing grapefruits round to help with my cold! I hope to come back again in the future. We had a great time! The snow and sledding was great, and the valley was fun! Also the dog loved the snow! We loved the cabin and had an amazing time. We sledded, and played in the snow. It was amazing. Dec 28, 2012 - Jan 1, 2013 Happy New Year! This house is fantastic! Thank you for keeping such fun and useful amenities! We loved the movies, games & snow toys, and did lots of cooking in the well-stocked kitchen. Having a 1-year-old, we were thrilled to find a crib & high chair, and even more excited to find the backpack carrier, which was put to good use. We spent a LOT of time sledding, and a couple of trips into Yosemite. Beautiful! We hope to be back here next year. We had fun ice skating. Thank you for sharing your home. We appreciate all of the "stock" amenities, which are much more than most. This gives a thoughtful and welcome feeling. The Ansel Adams views and of course all of the other formations, trees and sightings of wildlife in the YNP are amazing. It is great to take home with us the picturesque scenes we have only previously seen in books and movies. Fantastic hide away in the middle of nature. Beautiful home, wooden chalet. Loved all of our stay here. Yosemite is beautiful, scenery is awesome. Convenient - Comfortable - Charming. It's also quiet...but that doesn't start with C.
Our intrepid group of four thoroughly enjoyed our stay...A perfect time of year in a wonderful location. We all very happy that we can stay in your lodge. We feel we are back home. We enjoyed our times here and had a wonderful sharing. Thanks for everything. We all want to thank you for letting us stay in your lovely home. We enjoyed our stay and we are very grateful for stocking it. God Bless you and your family you made our reunion very memorable. Thank you for letting us stay -- we hope to come back in the future! P.S. it would be great if the caretaker would make sure to turn off alarm clocks set to 3:20 am for new guests who _don't_ want to get up that early!!! We had a wonderful few days here in the cabin and particularly enjoyed sitting on the terrace - with a beer or two. This was our first trip to Yosemite - we were hugely impressed. Yesterday evening we stayed in the park until sunset to take photographs of Half Dome in the changing light. Our visit here is part of a bigger trip, taking in four nights in San Francisco, and now on to Carmel. All very enjoyable! Thank you for making this a most memorable trip. Although we have visited Yosemite many times in the past, we have not stayed in a cabin. Yours has exceeded all our expectations! C.J., your housekeeper, was most pleasant. The neighbors were friendly. Everything was as it should be. We look forward to returning in the future. Thank you again. Many thanks for providing a wonderful home for our family to stay in for our trip to Yosemite. Loved the convenient locations to the southgate entrance. We really felt like we were at home when we returned each day from our excursions into the park. Never once did we feel we were missing somthing because your house is so well stocked! We had a great three days staying at your house and visiting Yosemite. We came a long way to do this and it did not disappoint in the least! We saw as much as we could but always allowed time for relaxation every afternoon on the deck. We really appreciated all the little touches around the house. Your pride of ownership really shows! The stay was awesome! I stayed in the futon room by myself. Even though the TV did not work it was still awesome. Good place to play hide-and-go-seek :-) We did! We also went to the General Store. More stuff than you would think! Mario Williams plays for the Bills! My wife and I plus five (5 of 6 came) of our children arrived here yesterday. We met the next door neighbor (Bob) very friendly but lonely. His wife just passed a few weeks ago. Bob is almost 90 and you can tell was married to his love for a long time (40+ years). We made some brownies and gave some to him. Go meet him and say hello. Life is Precious. Time is more Precious. Spend it wisely! We haven't seen any part of the park yet but will today and I will get back to you...(:-) IT WAS AWESOME! This was an incredible vacation. We went hiking, swimming, horseback riding, and lots more. Thank you for letting us stay here. It truly is a magnificent house! We all want to thank you so much! We have been to different cabins but this one was definitely the best! It is a beautiful cabin and I wanted to stay for another week. Thank you so much for letting us stay here! Great place, loved it. The cabin had everything we needed plus everything we wanted. Location is also great. Thanks for a great place. The B family had a great time at Yosemite. We thoroughly enjoyed our stay in this wonderful house, so well stocked and comfortable and close to Yosemite! Our daughter's wedding was fantastic, on our family will long remember. We enjoyed eating on the deck with all the family and the little ones running circles around the house. We really enjoyed our stay in your inviting cabin! Thanks so much especially for the amenities you provided for small children. The high chair & crib were a great help to us + enjoyed a lot of use! Such a great location & incredibly comfortable, even in the warm temperatures this week. Thanks for providing such a great gateway to Yosemite! We'll be back! My favorite thing was the TV/VHS. The dish network thingy was inoperable, so we watched movies. I (heart) Fantasia! Also thanks a bundle for the WIFI. - D.
Well we are back for the second time. Again everything was wonderful. Thank you David! We will be back! We enjoyed your house. Thanks very much! Very close to park. Was very impressed with how well stocked the house was. We had a great trip. We enjoyed our week-long stay very much! The cabin is warm, inviting, and comfortable. We had a 2 year-old, 11 month old, and 8 month old (all boys!) with us, and this is the first VRBO place that we've stayed in that has catered to children. The cabin is also well-stocked ~ thank you! We had 4 memorable days in Yosemite and chose to spend 2 days of relaxation here! The deck and the fireplace were highlights! My family really enjoyed this lodge and Yosemite. I, no I mean We will never forget this trip! We had a great weekend! The cabin is beautiful and we are looking forward to staying again! This cabin Rules! We really enjoyed the central location. We had a great time using the fully stocked kitchen for great meals after a long day at Yosemite. We will be keeping you in mind for our next trip to Yosemite. Had a great time at the cottage. Much more convenient than a hotel! Made it into the valley once, Spectacular. Sadly an unexpected 4-6" of snow curtailed more exploration. Snow chains are a must! Roads went from clear to ice rink in less than an hour. The forecast continues to look worse, so we will have to curtail our vacation and head home early while we can. We will be back. You don't know me but I Love your house! Very well organized efficient and a great place to be. 1-6 to 1-8 Thank you so much! My family had a wonderful time. Your home is so welcoming. We will see you again. S.
12/19/11 - Thoroughly enjoyed our stay. A wonderful home to get away for some quality family time. Great location and a peaceful place to be. Thank you! - The Ls. All the comforts of home, and then some. We truly relaxed and enjoyed our surroundings. Great peaceful energy in this place - we weren't ready to leave but are planning on returning next Spring. The BBQ at Todd's in Oakhurst is off the hook! Thanks for everything in this great home. We got married on 10/28! We'll be back to do this again. This beautiful peaceful place gave me the opportunity to fall in love all over again. Thank you Yosemite and Thank You for this magical palace in the woods. We enjoyed staying in your beautiful home, we loved it very much. A home away from home! A wonderful "Mountain home" - the beautiful decor fits the mountain scenery. Very clean too! We found everything we needed - a real pleasure to live in it. Thank you for making our vacation so special, we hope to come back next year! My wife and I have been talking about coming to Yosemite for almost as long as we have been together. We hiked to Vernal Falls, Sentinel Dome, Taft Point, West Valley Floor, Wawona Point, Gaylor Lake, Tanaya Lake, Hetch Hetchy and drove to the end of Tioga Rd and to Glacier Point. We also drove down to Sequoia and Kings Canyon National Parks. It is hard to pick a favorite hike or a favorite day. We would recommend Embers at Tenaya Lodge and the pizzeria. Our favorite restaurant was Emma Elderberries in Oakhurst which was very expensive but was a lifetime experience. The house was perfect for us sitting under the Sugar Pines and watching the snow fly. We will recommend the lodge to anyone and everyone. We will miss the Sierra mountains. We loved staying at your cabin. It has so much character and everything you could possibly need. I loved waking up in the morning, looking out and finding myself amongst the trees. The kids loved looking for wildlife, particularly the squirrels. 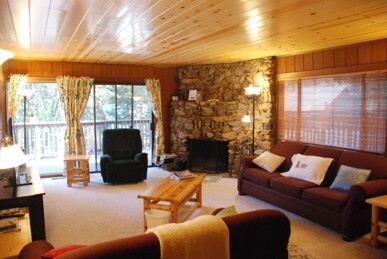 The cabin is in a fantastic location -- close to the park entrance and to Tenaya Lodge. The only dissapointing think was we couldn't stay for longer. Thank you _so_ _much_ for making our stay in Yosemite all the more special! Everything about the cabin -- location, amenities, "little touches" -- all added up to a memorable time. Again, a very big Thanks! Had a blast! Loved the cabin we will definitely be back. It was so nice + clean. Perfect location. Thank you from the Ms, Ns & Hs. We had a great stay and hope to be back again. The weather was perfect, the park beautiful, and the friends exactly what you want friends to be. This lodge is so nice and we had a lot of fun. Thank you so much for letting us stay here. We loved watching movies at night and eating our meals on the deck outside. Thanks again! We absolutely fell in love with your home! Thank you so much for allowing us to stay here, it made our trip to Yosemite a million times better! I would write you more, but we are walking out the door (heart). Thank you H-M family for allowing us to stay in your beautiful home! We enjoyed swimming at Big Creek Falls (now B is ready for Pittsburgh) and the rewarding hikes to Taft Point and Sentinel Dome. Some of us have never been to Yosemite before and we're so grateful that we were given the opportunity to, especially before college! PS: "Is this the real life? Is this just fantasy?" PPS: "Oooooooooh you gonna take me home tonight?" All three generations of us family thoroughly enjoyed the space and comfort of your super cabin and it is a great base for exploring. Had a great time - meals on the deck were great - very peaceful. Will definitely be back. Thank you David & Suzanne! We enjoyed the spaciousness and amenities of the cabin, and its close proximity to the park entrance. Our treat on our final night was seeing a huge bear lumbering down the street! Perfect location, spacious and clean. We loved it. Thank you for sharing your home with us. It was a real treat to have it stocked so well with kitchen stuff. The pizza from Tenaya Lodge was terrific. We hope to return soon! We thoroughly enjoyed our stay. The proximity to Yosemite's south entrance made it possible for us to do 3 separate day trips - to the valley floor, to Glacier Point, and to Mariposa Grove. Your kitchen had everything we needed to make yummy dinners when we came back to the cabin. We loved the huge deck - great for morning coffee and late afternoon reading. We felt very blessed to have amazing weather throughout our 4 day stay. We enjoyed our stay. It was great to be so close to Yosemite. The house was nice and comfortable - lots of space. We appreciated how well stocked it was. We would definitely return + won't hesitate to recommend your house. Thank you so much for letting us stay in your beautiful home. We loved how supplied the whole house is. We were thrilled at how many beds there were. This house is sooo cool! We all love our bedrooms and the sunroom and the view from the deck is AMAZING!!! It's so nice how much food and supplies they have in the kitchen! We also _love_ how the TVs have so many channels! This is a nice neighborhood and town. Thank you! We've had a perfect vacation. The house was very comfortable for all of us, and the quiet + beauty of the area -- as well as a couple trips to the valley -- made it a wonderful stay. We loved taking the walk out Big Sandy Road and up towards Fresno Dome too! We loved the cabin! It was so nice to come "home" each night and have such a great place to relax. We enjoyed cooking dinner, having a fire, and relaxing with hot chocolate and a board game. Yosemite was absolutely gorgeous! We loved all the sights of the valley floor, and we were awe struck by the vistas of Glacier Point. The hiking we did was great, and Mariposa Grove was awesome. This stay has definitely turned us on to the joys of a quiet vacation rental instead of a busy, crowded hotel -- Thanks! We enjoyed our stay at your comfortable cabin. We had all the comforts of home and appreciate that you thoughtfully stocked the kitchen, especially coffee! Thank you! We brought my sister and her family who were visiting from India and Yosemite and your cabin were the best way for them to get introduced to the United States! Thank you for sharing your wonderful cabin! We enjoyed spending a family vacation together with our family before our 2 oldest head off to college. We enjoyed many hikes by day, and loved coming back for reading, fires, hot chocolate, movies and laughs! Thanks for this fabulous - huge cabin. We had more room than we know what to do with. My boys loved the snow "tunnel" in front of the kitchen window. Everything was clean & wonderful & comfortable! The R family loved being at your spacious but cozy cabin. Met the pleasant neighbors and like having all the snow here though in the midst of the storms sounds like quite an adventure! 7 feet -- much still piled past the windows! We were treated to a light snowfall -- just flakes ~ 1 day this week. Got to see a bear at Yosemite Valley and all the beautiful land here. Thank you for providing such comfortable accommodations! Thank you for sharing your cozy + comfortable home with us. We had a fabulous time! We definitely plan on coming back soon. All I can say is WOW! We saw it all - heaps of snow falling, gorgeous sunshine, carriage rides, ice skating, snowball fights, shoveling, two trips to the valley. I can't imagine a better location to get stuck in a snowstorm. Heaps of thanks to you! We had a great time! the cabin is great... cozy, clean and adorable! Our families had a lot of fun in the snow! Thank you for the fabulous cabin it was the best I've ever stayed in the snow was fantastic and the house was very beautiful. It was a wonderful place to spend part of the Christmas season. Thank you. Thank you for the great accommodations in your wonderful cabin! We loved the spacious lay out and all the amenities! We had a great time ice skating at Tenaya Lodge and Snowboarding /Skiing at Badger. The snowfall was incredible while were here - kids had epic snowball fights! Thank you for allowing us the joy of staying at your cabin with such last minute notice. The park is beautiful this time of year. Snow shoeing at Badger Pass & Mariposa Grove were amazing - as was the lack of crowds and stinky tour buses! Your cabin made us feel right at home. We'll be back soon. Had a very nice time visiting the area! Thank you for sharing your beautiful cozy cabin with us. It was a true blessing. We had a great time. We had a great time staying at your house. It was very convenient for my meetings @ Tenaya Lodge, and much more spacious. We will recommend this to others and hope to return. Our family has had a great time. The cabin is the perfect base for everything we wanted to do. Thank you for providing all the comforts of home. We will not hesitate to stay again and to recommend to others. Thank you for the wonderful use of your home. Everything you could think of was right at your fingertips...which makes life traveling so much easier. Your home + forest just beautiful! Sierra + Maya (our Huskies) had a great adventure. We Explored the West Coast and loved it! We had a great time. It was really convenient to be next to the Tenaya Lodge, and be able to have great meals, information, etc, at our fingertips. What a way to sleep, in those flannel sheets. We hope to be here next summer. We loved your cabin! Your place couldn't have been nicer. We felt blessed to stay here. I love your cabin so much. We have a wonderful time here. Thanks for the convenience and fun time. We love your home. Hopefully we'll be back in the near future. We had such a wonderful time here. The whole family is so blessed to have Margaret who helped us and who was very accommodating. Thank you so much and we'll see you soon. We loved your house!! We had a great time and hope to return here in winter. Thank you! As a self professed city-girl, I thoroughly enjoyed your cabin in the woods. Coming from CANADA, it would've been great to stay here during the winter months. Maybe next time. Thank you for a great stay. We will see you next time. Good bye to the cabin in the woods. We always enjoyed our visits and enjoyed your rustic charm. We have fond memories of our time spent with you. If we never see you again, you shall always be special and hold a warm place in our hearts. Thank you for sharing your great cabin. We had a wonderful time. I had a great birthday, and our grandson loved the Sugar Pine Railroad. From: R, H, P jr and P R, K H, P & M T.
Thanks for the wonderful cabin this is our 2nd time in this cabin and this is the nicest cabin ever! If it's not sold by the next time we come we're definitely taking this cabin again! THANKS AGAIN! This is the finest cabin I've ever been in ever, it's the best! We would buy it but it's really expensive, and isolated. Thanks for the fun time! We had a blast. Your house was great - all of us slept great + had lots of fun! Thanks so much for a wonderful weekend. This house rocks. We will be back. Your fabulous house surprise us a lot. We had such a great time here! Loved the house!! Beautiful home, will come back next year but to stay longer than 2 days. Love the snow & the weather, had lots of fun. My mom had a wonderful time. My dad did too. My brothers and I were playing with so much snow and if we weren't playing with snow, we were eating at your very nice table or playing with your beautiful TV. Your beds were very comfortable and we had a great time. Thank you. We had a fabulous time. The cabin was perfect even more than we expected! We had a great family getaway. We are hoping to come back in the early summer! Thank you for sharing your wonderful cabin with us. This has been a wonderful escape from everything! Roasting marshmallows, playing cards in such a cozy place. A great place to make memories! We thank you so much! The cabin was treat. We had a great stay. It was a very relaxing trip. This was a memorable and unforgettable few days. Your home really felt like our home. Thank you for the sweet memories and the peace and tranquility. We shall never forget! Thanks again for a wonderful vist. We needed a break from S.M. and our busy lives. Thank you very much for this cabbin! From: M R Girl!!! P.S. I really liked the train ride!!! What a great retreat! Two families had a wonderful time. P.S. Make reservations for the horseback riding. Good Times! This was a wonderful get-away for us while attending a conference @ Tenaya Lodge. Thank you for your hospitality! We had a great time. We had a GREAT time. This place is HUGE! Very nice and clean. The first night we got here there was a deer walking on the path right in front of our car. Thank you for the most lovely cabin! Thank you for the beautiful cabin we injoyd it a lot we liked it in side I had a good time at Yosemite. We had a great time! I liked the house alout; it was the best cabin I've seen and been to. Me and my friend C played Gameboy in the cabin early in the morning. I had a supieer time My favorite place was the watering hole. Our family enjoyed the amazing veiw from the porch. We played lots of family games and had breakfast every morning. We visited Yosemite and it was fabulous. The trees here are amazing. Theres no better place to stay! 5/31-6/2/07 We had a wonderful family get-away here. My brother , sister-in-law, niece + nephew all brought our 89 year old father to visit Yosemite once again. He was raised in the park. Our grandma worked @ the Ahwahnee Hotel and he attended the school in Yosemite Valley. Having us all together & seeing his favorite place on Earth again has made him so happy and this cabin housed us all perfectly! Good times sunning on the deck & playing Scrabble on the floor in front of the fire in the evening! And what a privilege to be among the Great Trees! We had a wonderful two nights, perfect weather. The park was in it's full glory. 2nd time to stay here - keeps getting better. What a great place to stay. R, N, J, C, C, C, and N.
"Thank you for a _wonderful_ get away!" Thank you for a wonderful, peaceful time in this beautiful place. And your good company. We had a lovely time here in your beautiful home. Thank you!! We had a wonderful time here. Thank you so much for allowing us to stay in your cabin. This place is beautiful. Thank you so much. "Aaron's Sugar Pine Big Tree Cabin"
Since I was a little girl, I dreamed of visiting Yosemite. In my mind, the National Parks were places of wonder and grandiose beauty. When I entered this beautiful abode, I knew this was something special! I only wished my son and his family could be here with us. They too, would be humbled by such a gift. We are making every day count and will regreat having to leave all too soon. Your beautiful home has provided us respite. I have no doubt that this gorgeous gem will shine in my most dearest memories forever. I'm older now, but thank you from the heart....for making a little girl's dream come true. We had a great time. Nice home, felt comfortable. We will be back if you don't sell it. The TV in the bedroom does not work in the large bedroom. 7-31-06 I know you're supposed to sign this the day you leave, but I have to say I already love the place! Thanks!!! 7/15 - 7/20 - We had a wonderful time! The house is beautiful decorated. Thank you! Indeed a delightful surprise in the middle of the woods - exactly the peaceful retreat we needed. Thank you for providing us with an opportunity like that. Can't tell you what a pleasant surprise, indeed a delight it was to discover that the product was better than advertised. Your house is decorated so tastefully and thoughtfully as to make our stay totally enjoyable. We had a wonderful time with friends and family. April 2006 F-D family -> we enjoyed it. Thank you. N A Nov 24 I really love it. It has a butiful porch. And a good vew in the room upstairs by (heart) S A Nov 25 I realy love it here. It's so beautiful out on the porch. I just love this beautiful cabin! Nov 10-12 P, AM, E & B S Enjoyed your cabin so much. A real "after harvest treat". Nov 10-12 C S Thank you. Lovely place. Oct 8-13, 2005 Dad & I - K, L, B, C, I Family - fresh air - fine food & wine - our thanks for a fine time. September 25, 2005 N P Your pens need ink! September 25, 2005 C & J S "Thank you soooo much for the wonderful company and sharing your beautiful cabin with us!" September 25, 2005 A J Great time! All your hard work has really paid off. Really nice spot. June 9-12, 2005 Dad & I Thanks so much!